Sciatica is a term for inflammation of the sciatic nerve. The sciatic nerve (the longest nerve in the human body) emerges from both sides of the spine in the lower back and travels through the buttocks and legs to the feet. The pain is very intense, stabbing, sometimes pulsating. MASTER BALSAM FOR SCIATICA The rich presence of various herbal ingredients allows Master Balsam..
Kapsamax for stiff muscles and nerve paralysis Kapsamax balsam multi herbal formula stems from .. 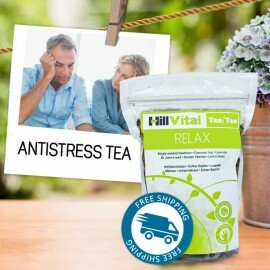 Tea Relax - herbal anti-stress tea Stress is part of our everyday life. We are under continuous s..
Herbal tea for weight loss. Composition of 8 herbs boosts metabolism and aids in natural weight loss. Natural substances act from within and help start the process of fat burn and supply energy. Away with unbearable pain, burning, itching and tingling! Phytotherapy is a proven method of addressing a variety of health problems. 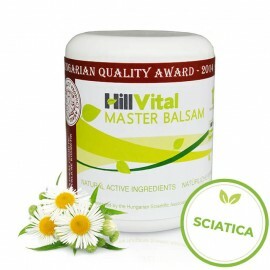 HillVital proudly stands behind this centuries-old herbal tradition and has been presenting Master Balsam as a sciatica solution for a long time. This cream, untouched by preservatives or artificial additives helps treat the above-mentioned undesirable symptoms of sciatica with its powerful natural composition. A glimpse at our balsam’s herbal composition will give you hope that in this case you have found what you have been looking for and that our product will help alleviate your ongoing pain. 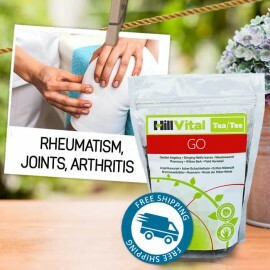 It contains a variety of natural analgesics and remedies that release muscle tension and herbal extracts of eucalyptus and mint that bring cooling effects to the affected tissues. The beneficial effects of our products are verified by time and scientific analysis of the healing substances contained in our cream. Take Kapsamax balsam for example and its main ingredient capsaicin. It is a substance that will help you relieve pain and improve blood flow to the affected aching muscles which is essential when suffering from sciatica. For more information, see Kapsamax for stiff muscles and tingling of limbs. Take a look at our Tea Relax. Its main benefit is relief of both muscle and mental tension. The blend’s main ingredient - valerian - acts in a sedative way and is a natural analgesic. Pain emerging from both sides of the spine in the lower back travelling through the buttocks and legs to the feet. The root causes of this unpleasant painful condition can be either avoided by maintaining a healthy lifestyle or it might be something we can’t control at all. Smoking, excess weight, and, to some extent, a profession, can significantly increase the risk of damage, deformation, or injury to the structural part of the back, the lumbar vertebrae or the surrounding muscles. You can also experience sciatica pain when you get a cold. While you can take preventive measures against sciatica, there are factors, however, that you simply can’t control such as gender, age, genetic back and muscle deformations or other anatomic anomalies. Sciatica can stem from other pathological processes such as autoimmune disorders, diabetes, infections, pelvic organs diseases, etc. Medical statistics indicate that compression of the sciatic nerve is the most common cause of sciatica. Nerve compression can be caused by popping of the intervertebral discs or by narrowing of the spinal canal. The third mechanical cause of sciatica is the shift of the vertebra. The vertebrae are interconnected by ligaments, muscles and joints, which keep them in a stable position. In the case of injury or degenerative changes, this solid structure is broken, resulting in e.g. to sciatica. Sciatic nerve compression can be also caused by the piriformis muscle. It’s a small muscle near the sciatic nerve. Cramp or contraction of this muscle develops extra pressure on the sciatic nerve leading to neurological problems. Long-term sitting is a risk factor that leads to sciatica.